Successfully Added Winter Gloves with LED Light (GREY, Large) to your Shopping Cart. 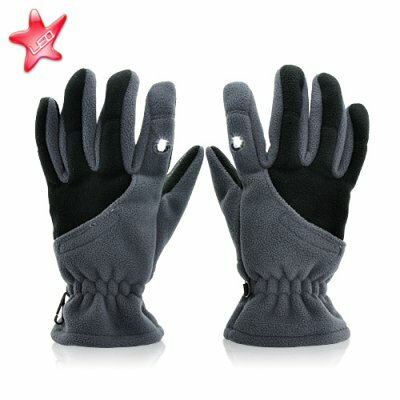 These cool-looking gloves are made of polar fleece for ultimate warmth and comfort. Plus they come with anti-slip protection on both finger and palm areas which is very useful for manipulating objects or just keeping your gloved hand on the steering wheel. But that's not the best part! Like from some kind of science fiction novel, these amazing gloves come with built-in forefinger LED lights which make these the gloves of choice if you enjoy nocturnal trekking or just want to hold the keyhole of your house or car at night. The fact is, many projects require the use of both hands leaving no option for holding a lamp or flashlight especially for work in dark and/or narrow places. But that's all changed! Now you can wear this amazing LED glove with forefinger LED light. Just focus the beams ON your work so you can use both hands FOR work. If you enjoy camping at night, night fishing, night hunting or any type of nocturnal outdoor activities then these are the perfect gloves for you. Now for some nice numbers! The LED bulb produces 13,000 MCD of LED light and has a life rating of 50,000 hours. This device uses 2 x CR2032 batteries and it can provide approximately 14 hours of continual light. Stocked in a men's Large size, these thermal gloves with LED spot light come at an extra low price and are in stock now and available exclusively from the leaders in China Wholesale Electronics, Chinavasion. Hurry and get your sample orders in now so you can see what a great product this is. After 60 days this item will come with a 8 piece MOQ (minimum order requirement). The LED light switch is located beneath the LED light itself and it's very easy to switch on. It's just a matter of feel and touch. You will be able to feel where the light switch is located and just press it to turn on the LED light. Does the CVLJ-LT16 come in any other color or size? This model of thermal glove comes in the "L", large size. The CVLJ-LT15 comes in “M”, medium size and is Red colored.